Alfalfa SeedsPack Size1kg bag ..
Blanched AlmondsIngredientsAlmond (nuts) (100%)Size1kgProduced in a factory hand..
Almonds Flaked - blanched & slicedIngredientsAlmond (nuts) (100%)Size1kg .. 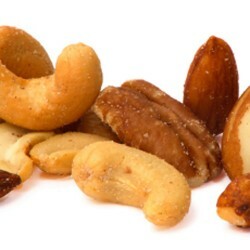 Ground Almonds - also known as Almond FlourIngredientsAlmond (nuts) (100%)Size1kg ..
Nibbed Almonds - blanched & choppedIngredientsAlmond (nuts) (100%)Size1kg .. Raw Almonds - shell offIngredientsAlmond (nuts) (100%)Size1kgProduced in a facto..
Smoked AlmondsIngredientsAlmonds(nuts), Salt, Whey Powder(milk), Rusk(Wheat Flour, Salt), Ye..
Brazil NutsIngredientsBrazil Nuts (100%)Size1kg ..
Roasted & Salted Cashew NutsIngredientsCashew Nuts, Rapeseed Oil, SaltSize1kg .. Shell off Cashew Nut KernalsIngredientsCashew Nuts (100%)Size1kgProduced in a f.. Chestnut - Vac PacIngredientsWhole Chestnuts 100%Pack Size1kg (2 x 500g) .. Chestnut Puree - SweetenedIngredientsSugar, Chestnuts, Water, Vanilla ExtractPack Size .. Chestnut Puree NaturalIngredientsChestnuts, WaterPack Size870g ..
Coconut Chip is the dried, sliced kernel of the mature fruit of Cocos nicifera. It is pasteuriz..